Another year of Jihad against the foreign occupation has elapsed. Over the last fourteen years, 2015 can be labelled as one of the most successful and inspiring Jihadi year which was fraught with numerous significant and sometimes unanticipated achievements in its fold. To encompass all the political, military, social and cultural activities in this one article is a painstaking task therefore we will only confine ourselves to the crucial Jihadi incidents, successes and conquest. On Sunday 4th January, two major commanders of the unrestrained Arbaki militiamen were killed. One was called ‘Khalil’, the head of Baraki Barak district Arbakis and the second one was the crime officer of Qara-Bagh district in Ghazni province. On the following day, Monday 5th January, several foreign soldiers were killed in a successful martyrdom attacks of Mujahidin in ninth police district of the capital Kabul city and near Jalalabad airbase, in the eastern part of the country. On Tuesday 6th January, Mujahidin of the Islamic Emirate launched large scale attacks in Badakhshan province in the north east of the country. On Wednesday 7th January, a successful martyrdom attack was carried out on the police academy in Khost province in the east. Similarly twelve stooge soldiers were killed and twelve others surrendered in the central Baghlan province. On Sunday 11th January, the convoy of governor of Paktika province was brought under attack resulting in casualties and losses for the enemy. On Monday 12th January, the security commander of Mizana’district in Zabul province was killed. In another significant incident, an infiltrated Mujahid policeman managed to kill all district officials and workers including their commander in Nowzad district of Helmand province. On Wednesday 14th January, the security commander and head of anti-crime department of Almar district in Faryab province were killed. On Sunday 18th January, a successful martyrdom attack was carried out on policemen in Lashkargah city, the capital of Helmand province. On Wednesday 21st January, tens of Arbaki militiamen surrendered in the suburbs of Ghor province. Similarly in Imam Sahib district of Kunduz province, Mujahidin successfully liberated five major areas from the malicious Arbaki militiamen. In addition to minor assaults, blasts and targeted attacks, huge operations against the internal and external enemies were incessant which increased day by day resulting in great conquests and liberations of vast areas. Jawand district in Badghis province; Charsada district on Ghor province; Dara Abdullah Khail in Panj-Shair province; Yamgan and Baharak districts in Badakhshan province; Tala-o-Barfak district in ‘Baghlan’ province; Nowzad, Musa-Kala, Sangin, Khanashin and the centre of Baghran district in Helmand province; Ghoriyan district in Herat province; Char-Dara, Dasht-i-Archi, Qala-Zal and Imam-Sahib districts in Kunduz province; Want-Wegal district in Nuristan province; Kohistanat district in Saripul province; Goshshta district in Paktika province; Ishkamish, Yangi-Kala, Khwaja-Ghar and Darqad districts in Takhar province; Kharwar district in Logar province; Kham-Aab district in Jozjan province; Khwaja-Musa and Garziwan districts in Faryab province; Ghorak district in Kandahar province; Khogyani district and the centre of Nawa district in Ghazni province. In addition to the above mentioned conquests, the most significant incident of the year took place on Saturday 28th September as the capital city of Kunduz province, the sixth largest city of the country, came under Mujahidin control. The governor office, central command, main castle, all directorates with the exception of some installations at the airport and entire city remained under the control of Mujahidin for one and a half week. Later, to avoid the civilian casualties and civil destruction due to the indiscriminate and brutal bombardment of the foreign invaders, Mujahidin decided to withdraw from the city. In the wake of this significant conquest, Mujahidin broke the central jail of this province and liberated a large number of their own colleagues as well as other innocent prisoners. They took possession of secret documents of the national security department and a huge amount of light and heavy weapons and several vehicles of ammunition were also seized. Though the Mujahidin of the Islamic Emirate did not disclose the exact amount of their gains due to military restrictions however the stooge admin admitted in a report provided by a fact finding mission which stated that thirty seven armoured vehicles, two T-62 Russian tanks and more than one thousand light weapons of the mercenary national army were missing including several night vision binoculars. Like Kunduz, Mujahidin also managed to get so close to the centres of Ghazni, Zabul, Uruzgan and Ghor provinces that the officials of the stooge regime began fleeing in panic. On Monday 14th September, Mujahidin broke into the central jail of Ghazni province and liberated four hundred prisoners. In addition to the above mentioned provincial centres, the capitals of Baghlan, Helmand and Faryab provinces remain only at a stone through away from Mujahidin of the Islamic Emirate. Inside Kunduz province, Char-Dara, Gor-Tepa, Qala-Zal, Imam-Sahib, Dasht-i-Archi, Ali-Abad and some areas of Khan-Abad districts were completely liberated from the malicious Arbaki militiamen. In this way we can say that Mujahidin prevailed in most areas of Kunduz province that’s why they managed to bring the centre of this province under their control. In the Markazi Baghlan district of Baghlan province, several police posts and military bases were conquered and destroyed. In Dahna-Ghori district, three battalions and several other posts were captured. In the suburbs of the capital Pul-i-Khumri, several villages and areas were liberated. Similarly vast areas in Tala-o-Barfak, Dand-i-Ghori and Burka districts of Baghlan province were freed from the enemy. 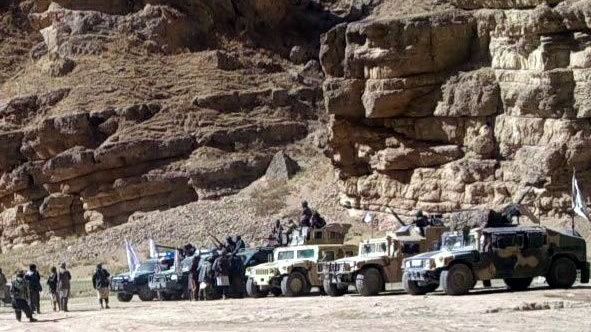 Warduj, Raghistan, Jurm, Argo, Yamgan and Baharak districts of Badakhshan province, tens of military posts and several battalions of the mercenary army were conquered and destroyed by Mujahidin. Consequently all routes between these districts were restored, areas were freed and Mujahidin’s influence was increased. In addition to the conquest of Nowzad, Musa-Kala, Sangin and Khanashin districts in Helmand province, several other areas came under Mujahidin control as they entered Baba-Jee area in suburbs of the capital of Helmand province and the notorious Arbaki militiamen were driven away from the area. Great progress was made in the suburbs of Nad-Ali district. Shoraki, Qala-Gaz and Haidar-Abad areas in Grishk district of this province came under Mujahidin’s control. Only some posts of the enemy are left between Mirmandaw and Zunbuli areas. Similarly most areas of Deh-Adam-Kham are liberated. In Marja and Kajaki districts of Helmand province only the centres are controlled by the enemy while all remaining areas are captured by Mujahidin. In briefly we can say that in Helmand province, Mujahidin are completely dominant,and the enemy is confined to Lashkargah city and some areas of Garam-Sair and Nawa districts only. Another example of last year’s achievements was the rapid progress of Mujahidin in Uruzgan province. Though the capital city and district centres of this province are still under the regime control however the remaining areas which were the stronghold of notorious Arbaki militiamen are now completely freed from their malicious presence. During the span of last year, large areas, villages and valleys of Dehrawod, Char-Chino, Chura, Chinartu, Tarin-Kot and Khas-Uruzgan were cleared from Arbaki and police presence. A large number of Arbakis in this province surrendered through the ceaseless efforts of ‘Invitation and Guidance’ Commission of the Islamic Emirate. A well-known Arbaki commander named Abdul Samad who was a warmonger had to abscond from the area eventually. Another significant progress of 2015 in this area was that two police chiefs of this province ‘Matiullah’ and ‘Gulab Khan’ were killed by Mujahidin one after the other with an interval of very few days. Faryab, Saripul, Badghis, Jozjan and Ghor provinces are another zone where vast areas were liberated from the enemy and captured by Mujahidin. Almar, Chilgazi, Qaisar, Pashtun-Kot, Khawaja-Musa, Garziwan, Ghormach, Shirin-Tagab and several strategic and densely populated areas of various other districts like Shaakh, Qarai etc. in ‘Faryab’ province were conquered by Mujahidin and the notorious Gilam-Jam militiamen (i.e. Dostam militia) were defeated there. Jwand, Qadis and most areas of Sang-i-Atish districts in Badghis’province were freed from the stooge regime control. All villages and areas of Dolina, Shahrak and Shinkot districts which were strongholds of government militiamen were liberated from their control as several groups of former government officials joined Mujahidin of the Islamic Emirate in those areas. In addition to significant conquest of Kohistanat, the districts of Sang-Charak, Sheram and Sozma-Qala of Saripul province also fell in the hands of courageous Mujahidin and the notorious Arbaki militiamen were completely expelled from all these areas. Omna, Goshta and Wazi-Khawa districts in Paktika province; Kohmard district in Bamyan province; Ali-Shair district in Khost province; Shilgar, Waghaz, Deh-Yak districts of Ghazni province including several areas in suburbs of the centre of this province; Bakwa, Khak-i-Safid, Bala-Baluk and Gulistan districts in Farah province; most areas of Dand-e-Patan district in Paktia province; Marawara, Chapa-Dara and Manogi districts in Konar province; several villages of Shaikh-Ali district in Parwan province; several posts in Tagab district of Kapisa province; several villages and valleys of Gizab district in Daikundi province; many military posts in Arghandab and Shahjoi districts and several areas of Qalat city, the centre of Zabul province; Kushk-i-Kuhna district, several military posts in Shindand district and the centre of Ghoriyan district in Herat province; the whole of Kharwar district and new areas in Narkh, Khoshi and Azra districts of Logar province; and fifteen check posts of notorious Arbaki militiamen situated on the main ‘Maidan-Bamyan’ road inside Jalraiz district of Maidan Wardak province were completely demolished and the protracted harmful presence of these militiamen was ended.